How To keep Your Leopard Gecko healthy? Can you overfeed a Leopard gecko? How long can Leopard geckos go without food? How long does it take for Leopard geckos to grow? Do leopard geckos need light at night? What can I feed my leopard gecko besides insects? Do you feed leopard gecko’s everyday? How often should my leopard gecko poop? Do Leopard geckos stop eating in the winter? Do you have to feed a leopard gecko crickets? What can I feed my leopard gecko that won’t eat? How often does leopard gecko shed? Can you feed leopard geckos worms? Are leopard geckos good pets? Do leopard geckos get lonely? Can leopard geckos eat ants? Can you put two female leopard geckos together? How many teeth do leopard geckos have? How do you tell male and female leopard geckos apart? How much does a leopard gecko cost? Do leopard geckos hide a lot? Today’s Leopard Gecko care sheet includes Feeding, habitat, Price, Morphs, Morphs calculator, Facts, intelligence and more. The Leopard Gecko (Eublepharis macularius) lizard has been bred in captivity in the United States of America for more than n30 years and it remains one of the most commonly kept lizards today. These tough saurians come in many colors, sizes, and patterns. This is a cool species for the home. 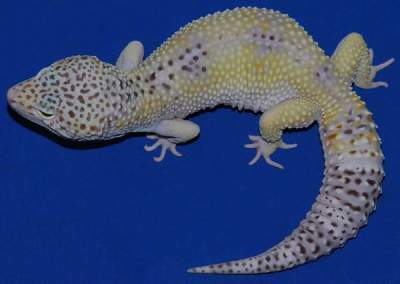 In fact we will also show you some of the coolest Leopard gecko morphs. Imagine a lizard that can vocalize, entertain and wash its eye with its tongue with ease. Need I add that this friendly dinosaur is beginner friendly! Leopard geckos are amazing companions for keepers of any skill level. Caring for them requires easy efforts and they come in plenty colors! Native Habitat: Found in the Middle East into India in rocky, grassland and desert areas. Lifespan in Captivity:6-10 years, but can go up to over 27 years. Expert Level:Great for beginners of all ages. 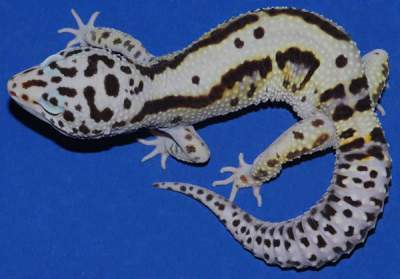 Captive-bred leopard geckos couples can be picked up at pet stores, at reptile shows and on the internet marketplace like eBay and on breeder websites etc. Various breeders have websites where you can go learn about, select and buy healthy leopards, which often sell for prices between $20 to $3,000. 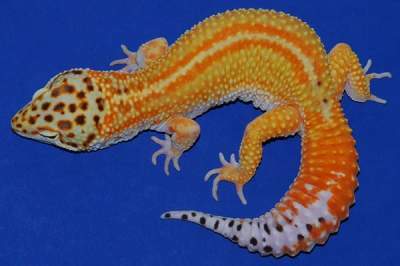 There is a big collector market worldwide for the rarer variations of leopard geckos. Leopard geckos live long as compared to some reptiles. Averagely, you can expect your geckos to live 6 to 10 years, but many males live 10 to 20 years. At least one male is still breeding at 27½ years of age. At the end of using our simple leopard gecko care sheet, you’d become a Pro Reptile keeper! Rubbermaid or (Sterlite or Terrarium) tub. You can keep your Leopard gecko(s) in whatever way is easiest for you to be able to provide the best care. The “size up” method is the best. Meaning, you will make your gecko feel safer and avoid feeding issues that comes from spaces that are just too large. Plus, it makes it easier for them to stay warm. This does not apply to all geckos but it can occur to some (especially when they were places in large enclosures as a baby). As your Leopard babies grow you will need to “size up” their enclosure to provide them with enough room room to get into mischief or move about. As For a baby:5 gallon to 10 gallon is sufficient. As far as a tub, a shoebox size is probably best. Some gecko parents use plastic storage boxes as housing (although visibility is reduced). Whatever cage you use should be at least 1 foot tall. Ensure you have a secure screen top on your gecko cage that will support a light fixture, provide good ventilation and keep out the trouble cats. A hide box filled with vermiculite or moist moss is needed, so your leopard gecko can shed its skin properly. This secure setting is also needed for egg laying if you plan on breeding geckos. Artificial or live plants can be added for a nice decorative touch. Many times we tell people “You cannot house males together as they are aggressive”. Females on the other hand can live together if they are of similar size. One male and female(s) of similar size can live together, but probably shouldn’t unless you are wanting to constantly have little gecko babies. You will need a larger enclosure for a group. I would recommend 10 gallons more for every 1 adult you have. Lightning and temperature is another important aspect of Leopard gecko care sheet. The simple and best way to heat your Leopard gecko is by using an under-tank heating pad or tape. They are available online or at any pet store near you. Heating one end of the cage is best. This allows your lizard to choose its temperature based on its needs. 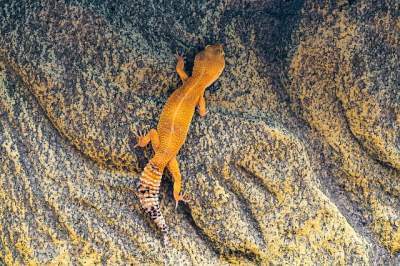 Heat rocks tend to become too hot for Leopard geckos and should be avoided due to the high risk of burns. For increased visibility, a low-wattage light can be placed overhead o the screen-cage top and left on 12 hours a day. Because leopard geckos are nocturnal creatures i.e. active at night (notice their vertical pupils), they do not need to bask under a special UVB light. The ideal temperature in the hide box is 88 to 90 degrees Fahrenheit at all times. 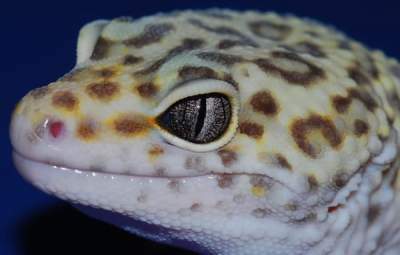 The ambient air temperature of the room they are housed in should be above 73 degrees….leopard gecko care sheet! Your surest bet to correct temperatures in your Leopard gecko’s enclosure is a thermometer. We believe you should at least purchase one (two is better). Buying two allows you to measure temperature on both the cool and hot sides. There are many options available on the market, So shop around to see where the best deals are. Feed them mealworms daily and crickets weekly. To entice their buds and excite them, we recommend sprinkling vitamin powder mix on both and supplementing your Leopard’s diet with other insects needed such as hornworms, Dubai roaches, super worms, CalciWorms (add calcium), Phoenix Worms (high source of calcium) and Waxworms (to add fat). There had been recent studies that suggest feeding your gecko Superworms as a staple diet instead of crickets and mealworms. Well, I disagree! Live insects are a must delicacy for your gecko; they do not eat veggies or plants. The best items to feed them are crickets, or mealworms, but you can treat your pet to superworms or waxworms once a week if you want. Do not feed your leopard gecko pinky mice. All insects must be first fed a nutritious powdered diet for at least 12 hours before being fed to your leopard gecko. This process is known as gut loading, and it is very vital to the hea;th of your pet. Hog or chick mash is available at all feed stores, and other commercial diets are available for this purpose, as well. Kindly place the insects in a tub of gut-load diet with a piece of potato to act as a source of water. Dusting your insects is one cool way to deliver important minerals and vitamins to your leopard gecko. Insects and the dusting powder can be placed in a deep tin can, or plastic bag, and shook gently to coat the insect’s bodies. When adding the dusted insects to the cage, be sure not to let the powder get into a gecko’s eyes. Another way to give the extra powdered supplements to your gecko is to keep a small jar lid filled with vitamin-mineral powder at all times. The gecko knows how much its body needs, and it will lick up the powder accordingly. Keepers or breeders can offer two appropriately sized insects for every inch of a leopard gecko’s total length. A meal every other day is fine. Therefore, a 4-inch-long gecko would receive 8 mealworms three to four times a week. It is normal for leopard geckos to eat their shed skin. A shallow water dish with fresh clean water must be made available at all times. It should be also stable, so it cannot be spilled. Cage substrate should be kept dry, so be careful about spillage. Make sure that adults and young leopard geckos can climb in and out of the dish you use without stress. Vitamin drops should not be added to the water. Note: Never hibernate or bromate babies their first year of life. Please wait until their second year. You need not hibernate your Leopard gecko if you are not breeding. They may be a little slow furing the cycle, but that I expected. Before, you bromate you will need to take your Leopard gecko off of food for about ten days so they can pass out all food in their system, but continue to offer water. Pear gravel, Artificial turf, Repti-carpet , Newspaper, paper towel , flat stones or shelf liners and tiles, no floor covering are OK. A debilitated or young leopard gecko might consume sand or dine-particle products on the cage floor, and this could lead to intestinal problems. Leopard geckos actually have a “bathroom” in one corner of their cages, and that area can be spot-cleaned without disrupting the entire system. Do not expose your gecko to commercial plant soils or sands that may contain fertilizer or pesticides. Warm hide (required), cool hide (optional, but strongly recommended, include sphagnum moss as a substrate) and moist hide (required for shedding). Having a moist hide is a matter of importance. Part of the advice in Leopard gecko care sheet is having a moist hide in their enclosure in order to prevent shedding issues with your Raptor Leopard gecko. Small Plastic Containers: You can cut holes for the gecko to go in and out of. However, you must sand the hole until smooth to avoid cutting your gecko. Purchae a Cave Style Hide: Once you have your container, you will need to put in a substrate that retains moisture. Options to consider include coco hummus, vermiculite, soil, paper towel, CatSpot litter or maybe peat moss or sphagnum – leopard gecko care sheet! Make sure you dampen your substrate, but avoid over saturating it so that mold does not grow. Plus, you can occasionally switch out the substrate when dirty with new. For humidity, make sure that you keep it between 20%-40%. Do not keep the humidity any higher than that as Leopard geckos can develop infections from too high of humidity. N hygrometer is one inexpensive piece of equipment that allows you to measure the humidity in your reptile’s enclosure. I strongly advice you purchase one. Generally speaking, avoid handling your leopard geckos on a frequent basis until they settle in and are more than 6 inches in total length. Once your gecko is big enough, it is best to sit on the floor, and let your gecko crawl through loose fingers and hand-over hand for 10-15 minutes per day until they get used to your touch. Shortly after you get them; it is a good idea to have your veterinarian examine your leopard geckos. When you first bring them home, do not handle them for 3 to 4 days – they need to get used to their new surroundings. If you’ve got questions about this Leopard gecko care sheet or about the health of your reptile, talk to a veterinarian familiar with reptiles or comment your thoughts below. We love to have your experience on leopard gecko care sheet too. Geckos are reptiles that live in Asia in the wild. They live in sparse grasslands and rocky deserts. They are nocturnal in the wild, hiding from fierce daytime heat under rocks and in burrows. In captivity they will burrow when overheated and shy away sometimes from bright lights. They often grow to about 10 inches long, although half of this is tail. Like most other lizards, they can break their tails. This is usually caused by fighting with other geckos or poor handling. The tails will grow back, but they will be shorter, thicker, smoother and less colorful. Geckos store metabolic water and fat in their tails. The temperature of their eggs determines the gender of the hatchlings. At 80 degrees, most will be females; at 91 degrees most will be males. At 86 degrees Fahrenheit, there will be an even mix. They clean their eyes with their tongues! They also have moveable eyelids, allowing them to blink and close their eyes during sleep. They are meat eaters and will stalk prey like a cat. 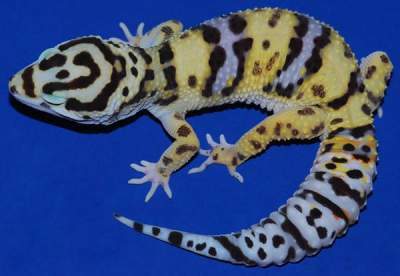 Leopard geckos come in a variety of color mutations or morphs. 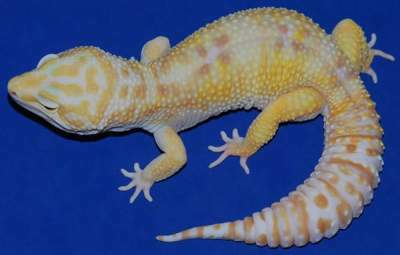 Your typical yellow with black spots is considered quite boring to some morph enthusiasts and prices will vary from color to color. There are currently over 100 different color morphs and combinations. Check out this list of some of the more commonly seen morphs. Before we get into the list of the coolest Leopard gecko morphs p\out there, it’s a good idea to have a general understanding of the vocabulary you’d come across when you shop for and learn about Leopard geckos. Genetic Traits:Characteristic, such as size or eye color that is determined by genetics. Recessive Traits: These are traits that come from a recessive gene. In order for recessive traits to be take shape in an offspring, they must be passed on from both parents. Dominant traits: Dominant traits show up even when only one parent has the dominant gene. When one parent carries a recessive gene and the other carries a dominant gene, the dominant characteristic will typically show up in the offspring. Co-Dominant Traits: This comes to play when an offspring displays expressions of two different but equally dominant traits. Phenotype: A word describing an organism’s observable characteristics. Genotype: This explains the organism’s genetic makeup. Line Bred: This is when geckos with specific characteristics are bred with one another with the goal of producing offspring with the same (or improved) traits. Line bred traits are also referred to as polygenic traits. Out-Crossing: This refers to the breeding of reptiles displaying various characteristics. This is generally done for two reasons. First, to minimize the risk of genetic defects through diversification. It is also done in hopes of introducing a new trait or having a certain outcome as far as appearance of the offspring. Homozygous: Homozygous leopard geckos carry two copies of the same trait, one from each parent. Heterozygous: Heterozygous varieties carry one copy of a wild or normal trait, and one copy of a designer or recessive trait. 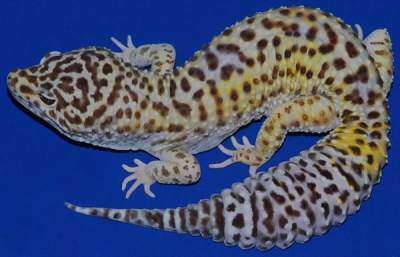 Since breeders continue to develop new variations on leopard gecko characteristics, the list of Leopard gecko morphs combination is ever-growing. So, if you’re shopping for a leopard gecko as a new pet, know that prices hugely depend on the characteristics of the lizard in question. Using our leopard gecko care sheet, you can take care of your pets! Not every breeder will have certain morphs in stock. Some prefer to breed the most expensive ones and the rest prefer….. You know the rest! This Leopard gecko care sheet guide should help you to become more informed about the coolest leopard gecko morphs, whether you’re just curious about different reptile varieties or you’re in the market for a leo of your own. This is the most common basic yellow leopard gecko with clack spots. 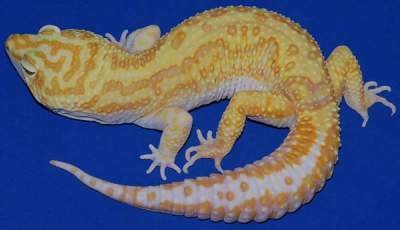 They are inexpensive and very popular at pet stores and photos showing leopard geckos. Do not be talked into paying big bucks for Normal morph seeing as they are readily available. Before the existence of over 100 different moprhs, there was just High Yellow. 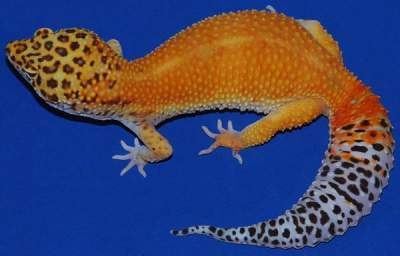 You either had the High Yellow or the Normal morph of the leopard gecko, nothing else. 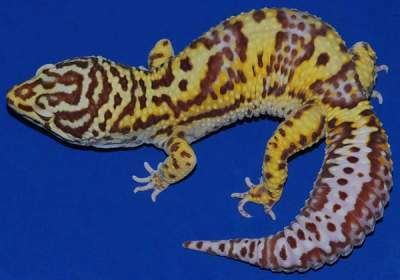 The High Yellow has more yellow and fewer spots than the Normal morph and you can have a combination High Yellow with another morph such as Jungle. 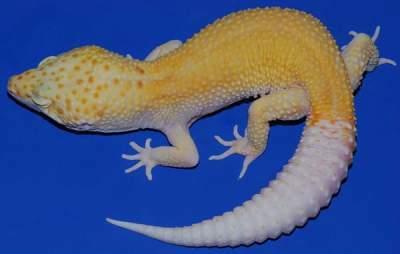 Albinism in leopard geckos is a bit different than the albinism seen in other animals. Albinism is generally caused by a lack of the enzyme tyrosinase, which prevents the animal from producing melanin. 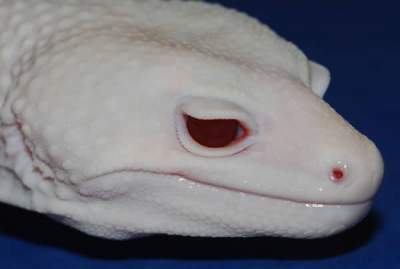 Albino leopard geckos produce a very small amount of melanin, and do not have this enzyme deficiency. (Technically speaking, this makes them amelanistic rather than truly albino). 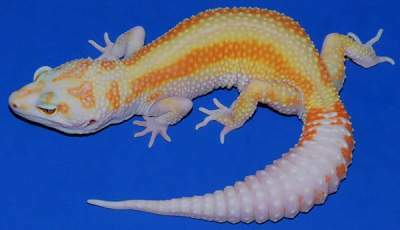 Therefore, the “so-called albino leopard geckos” usually display some light coloration. 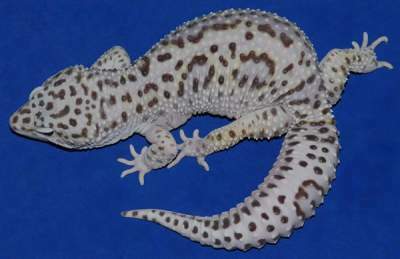 Mack Snow leopard geckos are pale with black bands. They are typically white as hatchlings, but develop some light coloring as they mature. Super snows are homozygous, and are often the result of breeding two Mack Snow morphs together. 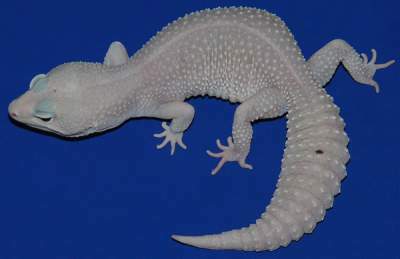 White coloring and heavy speckling are the signature features of this morph, along with solid color types. 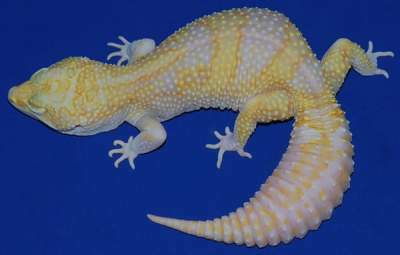 Tremper Albino morphs were one of the first albino leopard gecko strains to be discovered. They mostly feature silver eyes with visible red veins and can come in a variety of colors including orange, yellow, pink, and brown. Some people like to refer to this unique one as “the Florida Albino”. They are typically lavender in color, with brown spots. One of the most distinguishing characteristic of the Bell Albino is its light pink eyes. Rainwaters morphs are often lighter in color and smaller than other albino morphs. As hatchlings, they most often display pink bands and yellow bodies. Plus, rainwaters have darker eyes than other albinos. Rainwaters are sometimes called Las Vegas Geckos. Striped morphs display stripes that run down the length of their bodies. (Stripes are not to be confused with bands, which are rings that wrap around the width of the body). Bold stripes display stripes and patterns that run down the side of their bodies, rather than in the middle of their back. 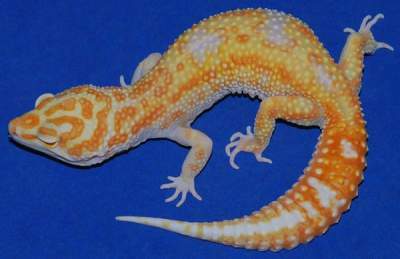 This morph is highly demanded by reptile lover and can sell between $200-$300, sometimes more! The Red stripe leopard gecko has two red (or reddish) colored stripes on each side of its back. Once your gecko is 6 months of age, this stripe begins to show up. Before that, the juvenile gecko will feature some brown coloration where the stripes will eventually be. The Raining Red Stripe morph is the result of crossing Rainwater Albinos with Red Stripe and Bold stripe species. These morphs look much like a Rainwater Albino with red stripes. Like their other striped cousin, Raining Red stripes can sell for some impressive price – with some totalling more than $600! Just as the name implies, these giants are bigger than the average leopard gecko. 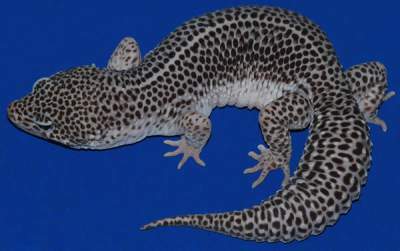 Not all large leopard geckos are necessarily true Giant varieties, though. This Super Giant is the homozygous version of the Giant and, as you may have predicted, is so named because it is even larger than the regular Giant morphs. This is truly the biggest giant leopard gecko variety. They are rare to find and are usually not available. The super-giant can weigh as much as 142g and can be sold for for over $1,200. Talk about a true monster! Hypo Morphs have less melanin than others and no more than 10 spots on their bodies. This does not include spots that may appear on their tail or head. Hypermelanistic morphs have more melanin, which gives them a darker pigmentation. Super Hypos are hypomelanistic leopard geckos that are yellow with no spots on their bodies at all. As you can see from the image above, Super Hypos often have spots on their head (unlike Baldies shown below). Baldies are Super Hypos with no spots on their heads. They often begin around $150 and become more expensive depending on how much of a redish tone they have. Blood Super Hypes can fetch upwards of $750! Hypo-Albinos or Hybinos, are created by combining a Super Hypo and any of the albino strains. They are usually orange-yellow or solid yellow colored with eyes that display characteristics of an albino variety. Some breeders may refer to these as Sunglow morphs. Ghosts, or simply Ghosts display very light coloration. This tends to fade even further as they mature. Hypo Ghosts are often difficult to difficult to spot as juveniles since they look so much like Mack Snows. To be said to be Melanistic, a leopard gecko must be all black. Although it has been rumoured that a melanistic morph was successfully produced, there are currently no known true Melanistic leopard geckos. However, breeders are actively working on developing them. The closest morphs currently available are Black Pearls and Black Velvets. One thing is for sure – when Melanistic Leopard Geckos are finally produces, they’re going to fetch huge prices! Blizzard gecko variety lack patterns, and instead display a solid color across their entire bodies. Blizzards are generally yellow or white. Darker-colored blizzards are sometimes called Midnight Blizzards. There had been times where a bright yellow Blizzard morphs are sold as Banana Blizzards. However, a true Banana Blizzard is really a yellow-colored Patternless. Blazing Blizzard ar Blizzard morphs that have been bred successfully with Albino morpgh varieties. So far, breeders have been successful at creating Rainwater and Tremper Blazing Bizzards. 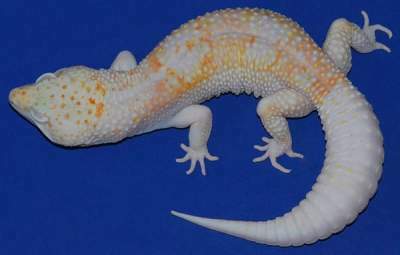 Currently under development by breeders, the Blazing Banana Blizzard combines Blizzard, Patternless, and Albino traits. 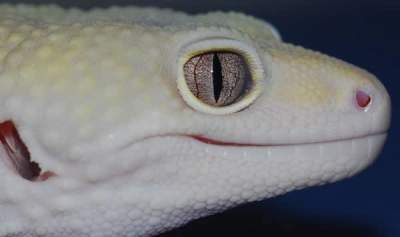 The eyes should look like the type of Albino they are bred from, and the body should display traits consistent with the Patternless morph. Also known as Murphy Patternless, these leopard geckos have no discernible spots once they reach adulthood. They are very similar in appearance to Blizzard morphs. Many are gray or purple, though some are yellowish or green in color. 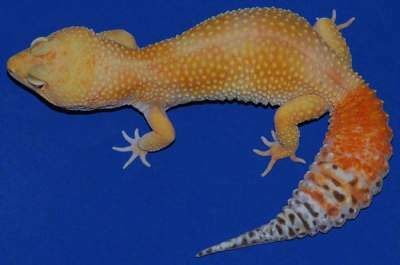 Albinos are a popular morph combination, as are Carrot Tail Patternless leopard geckos and Patternless Blizzards. An Eclipse displays solid-colored eyes. This trait is seen in Mack Super Snows, Tremper Eclipses, and blizzards. The Eclipse trait is recessive, so two Eclipse Leopard Geckos can produce Snake Eyed offspring as well. Snake Eye morphs are seen in Tremper Eclipses and Blizzards, and are characterized by having eyes that are not completely solid (resembling, in some cases, snake eyes). 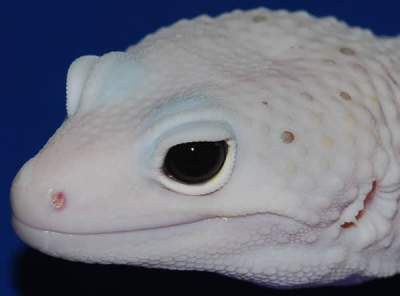 Breeders often list the percentage of Snake Eye a leopard gecko has. This percentage represents how much of the lizard’s eye is solid-colored. Enigma Leopard gecko have mostly white tails and speckled patterns. They also have blotches rather than defined bands and often become more spotted as they age. 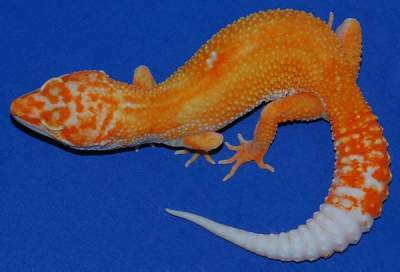 Any Leopard Gecko displaying any shade of orange can be considered a Super Hypo Tangerines tend to fetch higher prices than those with a less intense orange coloration. The Carrot tail morph is one that has an orange tail. 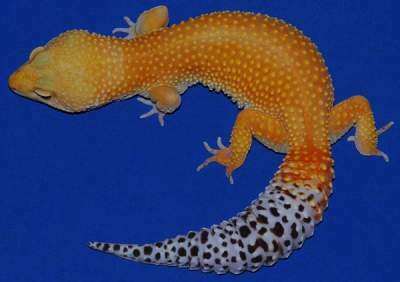 Most commonly, Carrot Tails are seen in Tangerines, Hypos, Albinos, Patternless, and Raptor Leopard gecko. Carrot Tail morphs have recently been reported among Blizzards as well. This term is used to describe leopard geckos with orange heads. 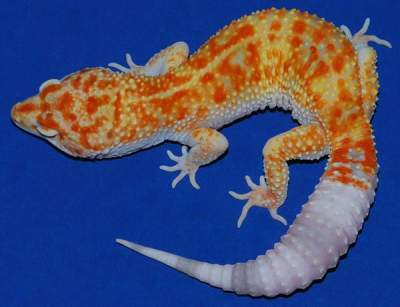 Like Carrot Tails, the price of Carrot Head Leopard Gecko often increases as the intensity of the orange hue increases. Aberrants features inconsistent or broken patterns. To be a true Aberrant, the disrupted pattern must be displayed on the tail or the body, but not on both. Aberrants are most commonly found among Normal and Mack Snow morphs. A jungle leopard gecko looks so much like an Aberrant, except that the broken pattern appears on both the body and tail. The gecko shown above is said to be Carrot head, Carrot Tail, and Jungle Tremper Albino! Truly rare amongst leopard gecko morphs, the Marble Eye trait is so named because it describes reptiles whose eyes have a 3-dimensional, marble-like appearance. This name is commonly used to describe violet or lavender variations on its body. This is a specially difficult morph to produce; most baby Lavenders begin to lose their signature coloration as they get older. Also known as Halloween Geckos, leopard geckos with this trait display bold markings on their heads and bodies. These markings are usually very dark and striking. This is an acronym for Red-eye Albino Patternless Tremper ORange. RAPTORs have red eyes and orange bodies. 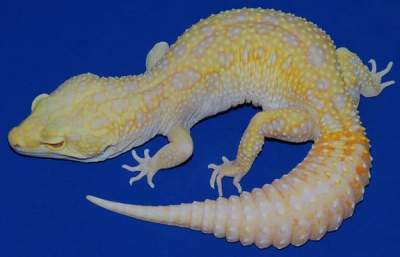 This morph is the result of combining Eclipse, Patternless Stripe, and Tremper Albino morphs. Reverse Stripe, Carrot Head, and APTOR morphs were all created during attempts to produce the RAPTOR morph. Albino Patternless Tremper Orange, or APTOR is very similar to the RAPTOR. It does not hwoever, have red eyes. This combination morph is a blend or RAPTOR and Blizzard traits. They have white bodies and solid red eyes. A solid white gecko might not sound like the most exiting morph at first – as you can see, though, these guys are visually appealing! 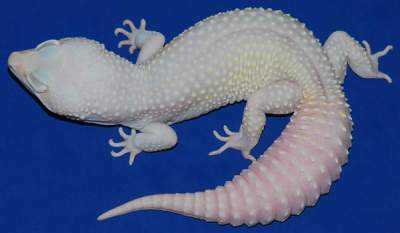 The Dreamsicle morph comes from combining the Enigma, Mack Snow morphs. They generally exhibit orange and while patterns (hence the “dreamsicle” name). Novas are a combination of Enigma and RAPTOR morphs. 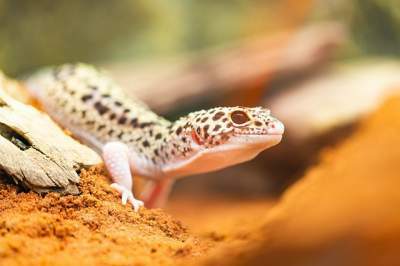 Enjoyed the Leopard Gecko Care Sheet Guide we shared above? We’ve got more tips for you! When buying any kind of animal, it’s super important to be selective about who you buy from and what you want. Because selective breeding of leopard geckos has become a really popular hobby amongst reptile lovers, some people who lack the expertise or experience they should have jumped on the bandwagon. Irresponsible breeding can result in disorders, defects, and even death in leopard geckos. A good breeder knows what the term “quality” means. 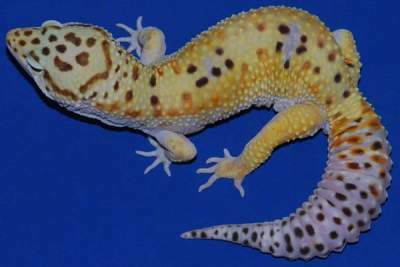 Commonly, a good breeder will also know morph varieties and genetics when it comes to leopard gecko. They must have a river of knowledge, and be able to answer your questions thoroughly and accurately. Not only should a breeder be able and willing to answer your questions before you buy, they should be available to you even after you make a purchase. Look for someone who encourages you to reach out if you have any questions/doubts once you’ve brought your new pet home. If a breeder is defensive when asked questions or is otherwise unpleasant to deal with, it could be a red flag. You might need to look elsewhere. Another pointer to look out for is a breeder who seems to genuinely care for the animals he/she is working with. Generally speaking, good breeders have good reputations. Look for testimonials or reviews by past customers. You can also find reptile communities in your local area or online. These groups often have great insights about different breeders. Unfortunately, we cannot recommend because we know no breeder that has the selection, quality, reputation, and customer service that you will need. 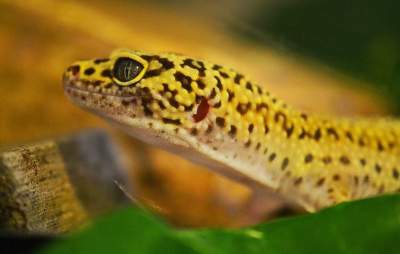 Leopard geckos eat waxworm, superworm, cricket, and Mealworms. Leopard gecko intelligence is impressive. Although they are capable of small functions; they are still pretty smart and communicate well with their bodies. They eat, feed, sleep, move around and play in their enclosure. Mostly active at night. It is almost impossible to overfeed them since they store their excess fat in their tail, but it is possible. Adult and juveniles geckos can go without food for 10 days to 2 weeks (though this is not recommended under normal circumstances). Feed them a high-quality diet fo fruits, grains and vegetables for at least 24 hours before offering worms to them. They do not stink and are considered clean animals. They poop in the same area in their tank and avoid this area so they don’t soil themselves. The babies should be fed every day and the adults every other day. Babies poop several times a day, as they eat small frequent meals, juveniles can go no more than once a day, and adults may go every two or three days. They generally avoid food before they shed, and males often stop eating during breeding season. So, yes some sensitive ones might stop eating during colder months. Feed them safe insects like mealworms or crickets. Ensure they meal is not too large so their mouth do not get damaged. An adult gecko will shed around 1x a month while younger geckos shed more often. You should never assist the gecko at all unless it has problem removing its skin. Yes, the answer is yes! Their docile nature makes them a pet for all family members. It is nit uncommon for geckos to live alone. Although some like to socialize with other geckos. They wil eat just about any insect as long as it is alive and they can catch it. Multiple females can stay together happily. A male and many females can be put together but two males should never be put together. They have 100 teeth and replace those 3-4 months each year. Yes, although their bite is gentle, non-venomous and not deadly to humans. The preanal pores in females are so small, and are hard to notice when compared to males. 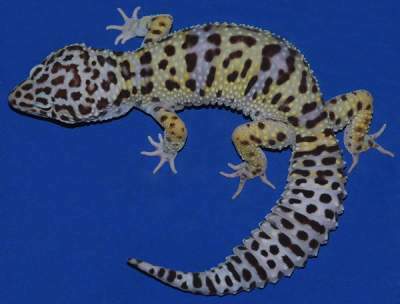 Pure leopard geckos sell for #20 to $40, while morphs can sell for $100 or more. Found our Leopard gecko care sheet really helpful? Support us by sharing this with friends and famiy!